The largest and most affordable Online Adult Bicycles Shop! Adult Bicycle shop the largest and most affordable! Do you want to buy an Adult Bicycle? Hollandbikeshop.com has the bicycles for adults you're looking for. In this category you'll find our wide range of bicycles for adults and, by selecting your personal preferences, you'll easily discover the bicycle that's perfect for you. At Hollandbikeshop.com you can find a wide choice of adult bicycles by brands like Victoria, LeaderFox, Batavus, Gazelle, Cortina and Giant. 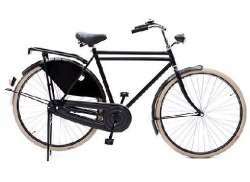 In our wide range of bicycles on Hollandbikeshop.com you'll find complete bicycles in various colors, sizes and models, like women's bicycles, men's bicycles, hybrid models, city bikes and fitness bikes with 1, 3 or even more gears. So you'll surely find the adult bicycle you're looking for. Hollandbikeshop.com is an Adult Bicycles dealer and has a large and affordable range. We also often have Adult Bicycles on sale or in our outlet, so keep an eye on our sale button. The largest and most affordable Adult Bicycle shop!